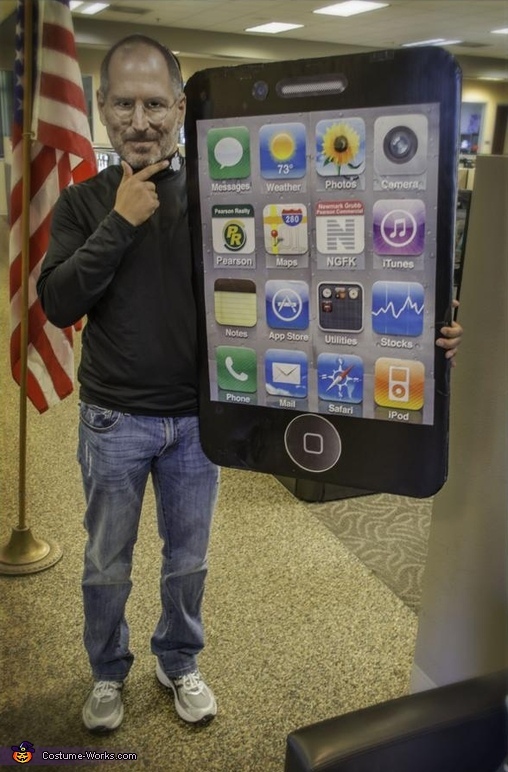 This is a Halloween costume I created to honor the late Steve Jobs. I initially was just going to dress-up like Steve Jobs, with the iconic black long sleeved turtle neck shirt, blue jeans and jogging shoes. However, after a bit of inspiration of what's possible and being hit with some creative juices, I decided to go all out and make a large iPhone/iPad accessory to match from scratch. To make the accessory, it was composed of a large poster board purchased from Office Depot. For the black sheen and glossy look, I purchased glossy black spray paint. It took 3 coatings to get just right. For the individual app icons, I downloaded them from Google and had to resize them accordingly with Adobe Photoshop. The gray "rain-drop" background is a combination of (10) 8.5x11 pieces cut and taped together to form one huge "screen" appearance. Each App plus the Home button was printed on a laser printer, sized appropriately and doubled-sided taped to the gray backdrop for full effect. Not content with just the front of the iPhone/iPad, I also applied the same level of attention to detail on the back of the accessory. Again, I had to download the images from Google, resize the icons using Adobe Photoshop, triple coat with black glossy spray paint, and use double-sided tape to place them where needed. The iPhone/iPad was a big hit and actually quite neat once completed. I hope you enjoy this Halloween costume that was created with much care and attention to detail. Thank you, please enjoy, as it is a pleasure to share the images with everyone.